It’s exciting to be so close to your home solar power system being installed. Your installer has set a date with you to have the system placed and put into service. All of the appropriate steps have been completed up until this point. But what about your utility company? How will you connect your system to your meter? Does your solar company help you with that? At West Coast Solar, we offer solar services to our Sacramento customers that include just about everything. We start with the initial desire and finish by providing maintenance and repair services years down the road. When you choose us, you can trust we keep solar simple so you don’t have to worry. In this post, we’ll discuss how you, your installer, and your utility company should work together to complete your solar power system. Not only do you need to work with your installer to complete the project, but you also need to be in contact with your utility company about the interconnection process. If you’re ready to get started on your system, give West Coast Solar a call today! Otherwise, read the rest of this blog series, starting with part one, or keep reading to have your questions answered. 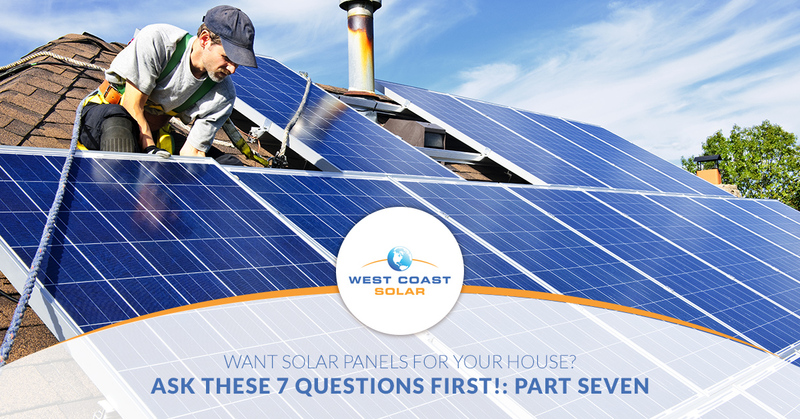 Question #7 – How should you work with your installers and utility company? The most important piece to the installation of your home solar power system is that it’s done correctly. What can you do to ensure this is the case? When you talk to your installer, see if you can meet those who will actually be installing the system before they get started—if it’s the individual on the phone, even better. This will allow you to voice your concerns, ask more questions, and communicate expectations. The worst feeling in the world is thinking you communicated effectively only to find out those listening didn’t quite understand. For the most part, if you’re about to have your system schedule for installation, a lot of work has already been done to ensure your property, system, and expectations are exactly what you want them to be. All that’s left is for your Sacramento solar company to deliver on their promise. How will your utility bill be affected now that you’re producing your own energy? Will the utility company raise its prices on you? What if you want to sell energy back to the grid? Get your utility company on the phone and continue to ask questions until you get all the answers you need. For the most part, the utility company will simply want to know how much energy you’re producing and if they can purchase the excess from you. Keep in mind that most companies will offer a rate well below market rate, so it may be better to store excess energy in a battery bank for later use. As mentioned above, you may be able to sell your excess energy to your utility company. How does this work? Net metering. What will happen, if your utility company offers this, is that you can transfer surplus power to the grid where it will be tracked. This surplus will then be given a rate of value and put against your utility bill, reducing the monthly charges. This is a great option for those using a home solar power system; however, be wary of companies giving you dirt-cheap rates for your surplus. It’s better to store your energy for later use than give it away for minimal gain. Sacramento residents have begun to discover the advantages and benefits of making the switch to solar power. They’re able to save money on utility costs, reduce their carbon-emission footprint, and contribute to a better future for their family in friends. As the energy prices continue to skyrocket across California, it’s time to consider alternative and renewable energy sources for your Sacramento home. Give West Coast Solar a call today! Want to read the rest of this blog series? Start with part one!